This week we’ve mostly done stuff under the hood (Steam, testing and tweaking), but we also mashed in a new system that’s long overdue. 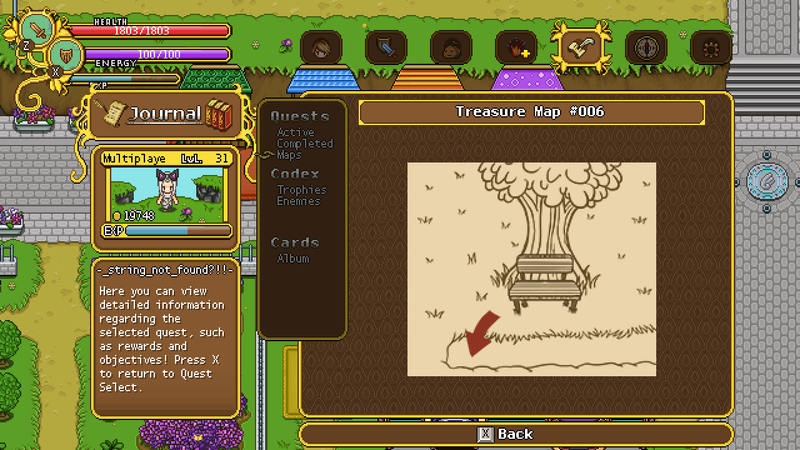 Since it’s a system that’s easy to implement and maintain (although mostly because Simon has been slacking off for long enough), we’ve “finally” added the Treasure Map system! Disregard the text to the left – it’s drunk! There are three types of maps. 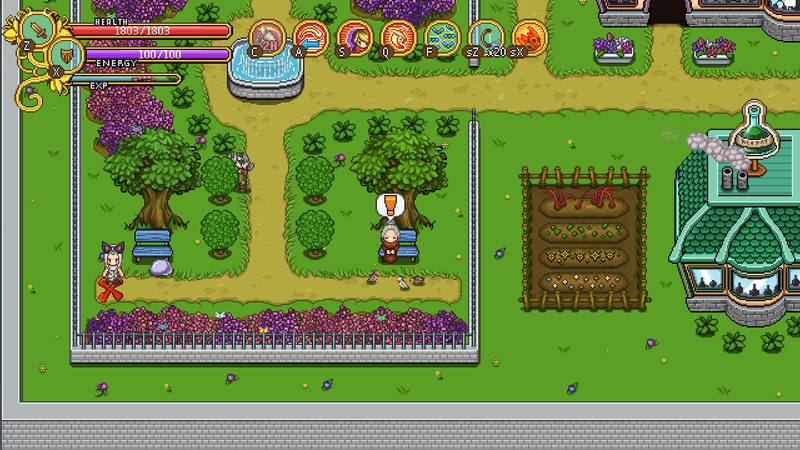 Firstly, there are screenshots of some location in the game that you’ll have to find. These are probably the easiest! The second kind is what you see above: some kind of sketch hinting a location. These could be pretty straightforward, like the one above, drawn from a different angle than the game itself, or even something completely different. The third and final version are treasure “maps” written in text! These are small stories or riddles telling you how to find a treasure. When you stand on the spot where the treasure is buried (take or give 10 pixels), a pulsating X will appear beneath your character! Simply press the action button to dig up your well deserved reward! Who? If you’re in the Desura beta and you have posted a first impression, reported a bug or in some other way provided feedback* when we start inviting people over to Steam, you will get an invite. Also, we’ll invite some more people from the IndieDB registration thread. In both these cases we will send a message on IndieDB asking you if you want a Steam key! You should automatically receive an e-mail when we send that message. You can still post feedback (preferably on the IndieDB private forums if you have access) if you forgot to do it when you got into the beta. When? We have a small checklist of stuff to fix, but fingers crossed we might invite some of you by the end of the week to test the waters, and the rest next week if the transfer goes smoothly. At that point we might send out a bunch of new invites as well. Posted by Secrets of Grindea at 2014/03/04. Tags: digging, Interface, Screenshot, Weekly Recap. More than beta, I’d like to actually pay you guys for this game on Steam when it’s done! Good night. I am part of a MMORPG magazine here in Brazil. Would join the open beta of the game to be able to give you a preview of the game to our readers. if you are interested I would like to join the beta to take this opportunity to our readers know a little more about this wonderful game! The treasure map system is as nice as the Arcade mode! It is a perfect addition to the game and entertains the player while it doesn’t steal the focus from the actual storyline. And it expands the puzzle factor! Again, such a nice idea! This feature looks really cool. It’ll be interesting to see in what other ways treasure maps are obtained, too. 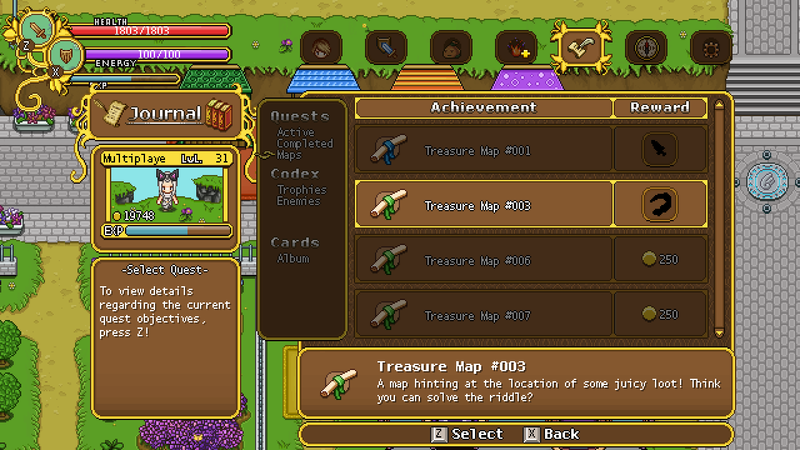 Are the treasures available only when you have the treasure map? Because it would be weird to be walking around and randomly finding red X’s. I had seen you an email with feedback and translations issues long time ago, would I be invited? Wow treasurehunting sounds very interesting. Anyway it sounds very promissing. …I love the game, so give me a key…. …just kidding… ..or?! Have a nice day, take all time you need to finalize the game. @Hippy0815: If you received a key some other way (like on one of Fred’s streams), you can send us an e-mail with your Desura account name and a link to your feedback (in this case a VOD of the stream)! @ManWHoSaysNii: We’ll announce when we’ve invited everyone we could find ourselves, and if we missed someone (like if they sent us feedback outside of IndieDB), we’ll ask them to mail us! @Rene: The reason we’ll send out PMs is to catch players who left great feedback in the past, but might not be still visiting the beta forum! By sending them a PM they will receive an e-mail. Regarding finding each other on Steam, a thread where users can post their Steam names sounds like a neat idea!